The Things We Don’t Do (translated by Nick Caistor and Lorenza Garcia, review copy courtesy of Pushkin Press) is a wonderful little collection of short stories, divided into five sections. Each section contains seven thematically-linked stories, few of which run for more than three or four pages. In addition to the stories, there’s also a collection of four ‘Dodecalogues’ at the end, semi-serious guidelines for writing short stories (the choice of twelve rules for each set is, as the writer says, to avoid the absurd perfection of ten…). Together, it all adds up to 170 pages of great reading. It’s a less a story than an ode to the joys of a lazy Sunday in bed. One of my favourites in this collection is ‘Mr President’s Hotel’, an intriguing story in which a VIP is constantly asked to sign the visitor’s book at hotels. However, this apparently tedious task takes on more importance when he discovers that a mysterious N.N. always seems to have been there first. When the sinister message leaver begins to direct their comments at the narrator, he suddenly feels threatened by a shadowy figure with no existence beyond the two initials and the notes. It’s a fascinating story, one that has you thinking of Kafka, and his protagonists pursued by unseen menaces. 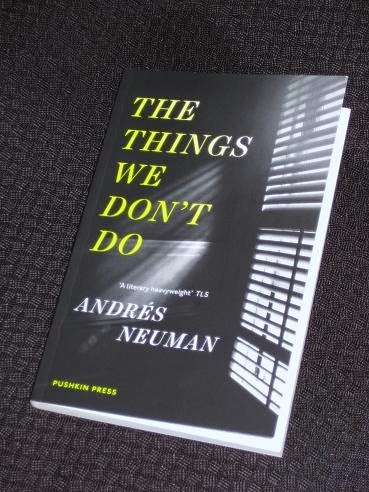 I’m trying to find out if there is a Spanish edition of Neuman’s book , The Things We Don’t Do. I’d like to read it in Spanish.